Your environment is everything to your business and employees. No one wants to work in a dark, windowless closet – just ask Ryan from The Office! Yet many companies still view their workspace only as a necessary asset. This is counterproductive thinking as your space is your greatest tool for growth. Imagine your typical fast food restaurant. Some days, it’s a great experience. Other days, your food is rushed and the service doesn’t reach its full potential. Now imagine your typical Chick-fil-a. Big windows, little flower arrangements on tables, and a staff that is always happy and ready to serve. What’s the difference? Environment and culture. Chick-fil-a maintains a mindset of serving others. That commitment is reflected in its environment. From the buildings to their scholarships for employees, they are committed to that focus. The culture and environment work to create a pleasant place for both their customers and their employees. 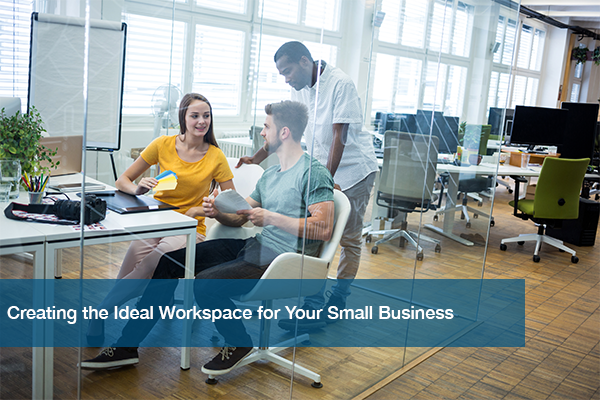 While your business may not have a drive thru or chicken nuggets, it does need a functional workspace. If you’re looking for an office space, check out our post on hiring a real estate broker! Most companies measure their offices in cost per square foot with a focus on pure efficiency. But people are not machines. Business themselves are ever-changing and growing entities. It takes more than an efficient use of space to keep your company and its people growing. For some creative ideas on how to make the most of a limited space, check out this American Express article. Find a venue that works with what you envision for yourself, your team, and your clients. A space near highways makes it easier to get to work, and nearby restaurants, fast food chains, and other amenities make breaks and downtime better for your team. Having an office with plenty of windows for natural light, clean restrooms, and a comfortable break room is just as important. Take note of what you want in your office space, and be as selective as needed to find the right venue. Seating: Flexible seating encourages innovation, brainstorming, and creativity. Assigned seating yields higher productivity and more focused work. Find what works best for your business. Floor Plan: Open floor plans improve communication and team work. Private offices result in greater personal productivity. There’s always room for a mix of the two as well. Track how these changes affect performance, not productivity. This means different things for every business, even different departments. A team focused on innovation will not benefit the same in a space designed for productivity. And don’t dock a layout that encourages conversation within your team or across departments. Giving your team a chance to chat isn’t just about letting them take a break; it’s about overall growth. The sharing of knowledge and a chance to brainstorm will improve your business’s performance. Your environment should be able to evolve as quickly as the world and technology around it. What works right now may not work in six months. Be prepared for change in your industry, your team, and the area around you. Businesses that refuse to adapt get left behind. Need an IT Partner for Your New Space? ITC can keep your business up and running in any workspace. We assist with IT issues, computer and network security and data backup, providing you with a complete IT solution. Schedule a free IT needs assessment today!